Click on the place that you wish to walk to. D'Artagnan will automatically find his way around any obstacles. Click on a door and d'Artagnan will walk up to it, open it, and walk through it. Click on any friendly characters to initiate a conversation with them. Click on your horse to ride it. D'Artagnan will walk to the horse and mount it. Click on the dismount button to get off your horse. D'Artagnan will also automatically dismount the horse when trying to perform an action that he can't do while mounted (e.g. opening a container, going through a door, and fighting). Click on an enemy to start fighting them. D'Artagnan will automatically walk up to the enemy and begin thrusting, parrying, and lunging at them. 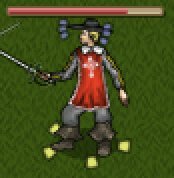 Don't click repeatedly on your enemy, just click once and let d'Artagnan do the fighting. He can also automatically defend against multiple enemies. When you see perspiration coming from your enemy's head, it means that they have lost focus and are temporarily vulnerable. Click on them to do a "super lunge". You will only have a second or two to click on them, so you will have to be fast. If you succeed, you will inflict massive damage to your enemy. After equipping a pistol or musket you will be able to select it from the game screen. Select it by clicking on the gun button in the bottom right corner of the screen. Then click on your enemy. Your gun will be discharged and you will automatically be switched back to using your sword. You will need to wait for you gun to reload before using it again. D'Artagnan will work on reloading the gun whenever he is idle. This is represented on screen by the red progress overlay on top of the gun button. Once the gun is reloaded you will hear a "click" sound and you will be able to click on the gun button again. You can also use the 'Z' and 'X' keys to toggle between your sword and gun.